Lovelock Featured in Climate Hustle - Watch Lovelock transform from climate fear promoter to climate doubter! Nowadays, Lovelock feels “laid back about climate change”. All things being equal – “and it’s only got to take one sizable volcano to erupt and all the models, everything else, is right off the board” – he expects that before the consequences of global warming can impact on us significantly, something else will have made our world unrecognisable, and threaten the human race. 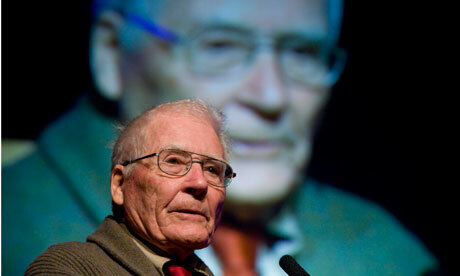 James Lovelock’s parting words last time we met were: “Enjoy life while you can. Because if you’re lucky, it’s going to be 20 years before it hits the fan.” It was early 2008, and the distinguished scientist was predicting imminent and irreversible global warming, which would soon make large parts of the planet uninhabitably hot or put them underwater. The fashionable hope that windfarms or recycling could prevent global famine and mass migration was, he assured me, a fantasy; it was too late for ethical consumption to save us. Before the end of this century, 80% of the world’s population would be wiped out…. Eight years after our previous encounter, he appears to have aged not one bit. At 97, he’s conceived a beautifully illustrated book of essays described as a “tool kit for the future”, The Earth and I, and written the introduction and conclusion; he goes walking every day, his hearing is perfect, his focus forensic and his memory unimpaired…. Lovelock has withering contempt for environmentalists’ opposition to fracking. “You see, gas in America is incredibly cheap, because of fracking,” he says. But what about the risk of triggering earthquakes? He rolls his eyes. He added that global warming proponents stated that the earth would get hotter and hotter but “they don’t really know,” and climate models are only based on what data goes into them, so it was hard to say what would happen in the future. The Interviewer asks: Do you think we should give up trying to save the Planet? Lovelock: ‘The business with Fukushima is a joke. Well, it’s not a joke, it is very serious — how could we have been misled by anything like that? Twenty-six thousand people were killed by the magnitude-9 earthquake and tsunami [that caused the nuclear meltdown], and how many are known to have been killed by the nuclear accident? None. Lovelock: The Revenge of Gaia was over the top, but we were all so taken in by the perfect correlation between temperature and CO2 in the ice-core analyses [from the ice-sheets of Greenland and Antarctica, studied since the 1980s]. You could draw a straight line relating temperature and CO2, and it was such a temptation for everyone to say, “Well, with CO2 rising we can say in such and such a year it will be this hot.” It was a mistake we all made. We shouldn’t have forgotten that the system has a lot of inertia and we’re not going to shift it very quickly. The thing we’ve all forgotten is the heat storage of the ocean — it’s a thousand times greater than the atmosphere and the surface. You can’t change that very rapidly But being an independent scientist, it is much easier to say you made a mistake than if you are a government department or an employee or anything like that. 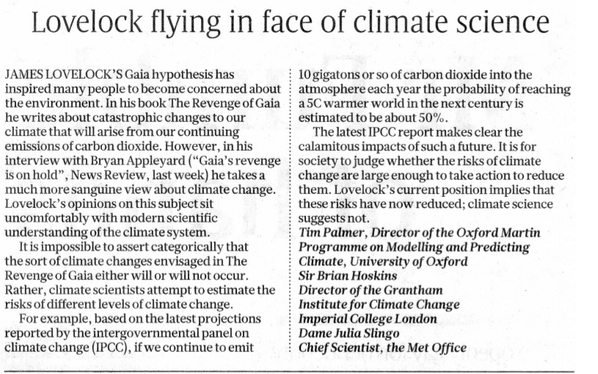 Lovelock: ‘We Need To Stay Sceptical About The Projections Of Climate Models’ – He now thinks he “tended to exaggerate the immediacy of global warming”, that “we may muddle through into a strange but still viable new world”, and that we can “keep our cool as the Earth gently warms, and even enjoy it when we can.” He thinks it is a mistake to take the Intergovernmental Panel on Climate Change’s “projections almost as if written in stone”; instead we “need to stay sceptical about the projections of climate models”.